A joint service honor guard escorts a transfer case during an "arrival ceremony" at Joint Base Pearl Harbor-Hickam in Honolulu on April 27, 2012. The Defense Department has acknowledged that human remains were not in fact arriving on that day. The ceremonies are held by the Pentagon's Joint POW/MIA Accounting Command. 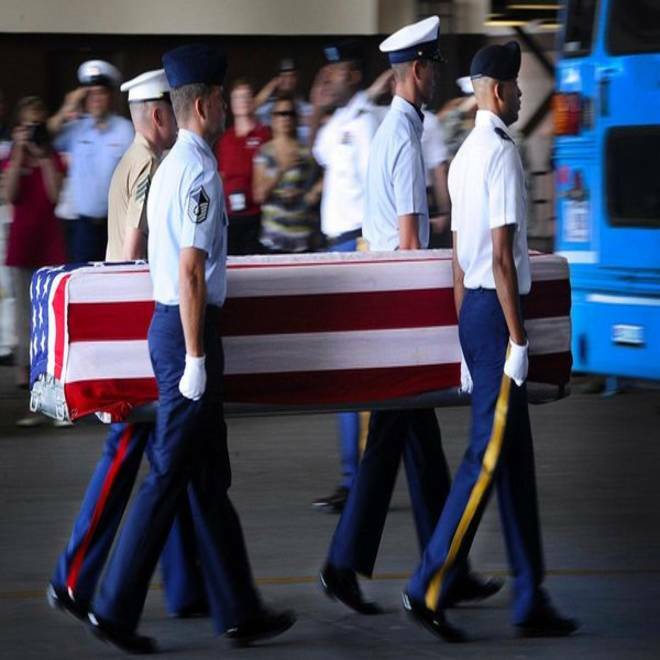 HONOLULU — A unit of the U.S. Department of Defense has been holding so-called "arrival ceremonies" for seven years, with an honor guard carrying flag-draped coffins off of a cargo plane as though they held the remains of missing American service men and women returning that day from old battlefields. After NBC News raised questions about the arrival ceremonies, the Pentagon acknowledged Wednesday that no honored dead were in fact arriving, and that the planes used in the ceremonies often couldn't even fly but were towed into position. The solemn ceremonies at a military base in Hawaii are a sign of the nation's commitment to returning and identifying its fallen warriors. The ceremonies have been attended by veterans and families of MIAs, led to believe that they were witnessing the return of Americans killed in World War II, Vietnam and Korea. The ceremonies also have been known, at least among some of the military and civilian staff here, as The Big Lie. Photos behind the scenes show that the flag-draped boxes had not just arrived on military planes, but ended their day where they began it: at the same lab where the human remains have been waiting for analysis. From now on, the Pentagon said, the ceremonies will be re-branded as "honors ceremonies," expressly described as symbolic honors for bodies previously recovered. "The name changed because they've already arrived, technically," said Army Staff Sgt. Andrew Smith, public affairs officer for the Joint POW/MIA Accounting Command (JPAC), whose mission is to return and identify the 83,000 missing service men and women from World War II, Korea and Vietnam. The agency is identifying the dead at a rate of fewer than 80 per year, at a cost of more than $1 million per identification. Bodies now wait in the JPAC lab an average of 11 years before being identified, according to an internal report released this year. Here's what the public has seen at the ceremonies, usually held about four times a year. A C-17 military transport aircraft was parked, its ramp down, outside hangar 35 at Joint Base Pearl Harbor-Hickam. At precisely 9 a.m., after generals and other dignitaries were introduced, a military chaplain offered a prayer, the audience sang "The Star-Spangled Banner," and a Marine bugler played "Taps." Then a military honor guard in dress uniforms carried flag-draped transfer cases, which look like coffins, down the ramp and across in front of the audience. The cases were placed in the back of blue buses and driven away. The emcee, reading from an official script, thanked the audience for "welcoming them home." The script continued, "After removal from the aircraft, the remains will be taken to the Joint POW/MIA Accounting Command's Central Identification Laboratory. There, JPAC scientists will begin the identification process." The Defense Department has used the arrival ceremonies as publicity tools, posting videos of the "arrival" on its website, on YouTube and on Facebook. A video of one of the ceremonies is shown below, and others are online here and here. The videos sometimes say explicitly that "the remains returned to U.S. soil on the C-17," and other videos leave the viewer to draw that conclusion. A video posted online by the Department of Defense shows the JPAC "arrival ceremony" of Vietnam and World War II vets at Joint Base Pearl Harbor-Hickam, Hawaii on December 9, 2011. Similar videos have been posted throughout the past seven years. The Pentagon has acknowledged that no one was actually arriving at any of the ceremonies, and that the planes they were carried from often could not fly. The Pentagon said its script for the ceremonies had been "misinterpreted." Here's what actually happened, according to eyewitness accounts and photographs taken behind the scenes at one of the ceremonies. Before 6 a.m., the members of the honor guard assembled at the loading dock behind the JPAC headquarters on the base. They loaded the transfer cases, which had been stacked outside the door to the lab, and the buses drove to the hangar. The C-17 had been towed into position outside hangar 35. The honor guard loaded the transfer cases into the belly of the plane, then practiced walking them through the empty hangar. Then the honor guard returned to the plane, and waited. At nearly 9 a.m., the public was allowed in: invited politicians, media, families of the missing and veterans. Employees from JPAC were bused over to fill out the crowd. Jesse Baker, an Air Force veteran of World War II and Korea living in Honolulu, said he has been to more than 50 of these ceremonies. He told NBC News that he's always been under the impression that the plane had just arrived carrying recovered remains. "If I have been fooled, I am going to be a very pissed-off citizen, because I've been going for years," Baker said. "And I know a lot of guys who are going to be pissed off. ... They're out there honoring warriors." Baker tried to make sense of why America's Department of Defense would work so hard to trick him and other veterans. "That's disturbing. I don't know when they stopped being honest and switched over to this Mickey Mouse, but whoever did it, I hope they find him a new job somewhere." One leading figure in the MIA/POW field said she has known for years about the charade. The head of the largest group of families of missing service men and women, Ann Mills-Griffiths, is a staunch defender of JPAC, but she told NBC that she has warned Pentagon officials and JPAC repeatedly that they should stop holding "those phony arrival ceremonies." But Mills-Griffiths, the chairman of the National League of POW/MIA Families, said she had never told any family members that the ceremonies were phony, because she supported JPAC's mission, if not the way it was carrying it out. On Wednesday, after NBC submitted questions, the Pentagon acknowledged that the airplanes were often towed out of maintenance hangars for the ceremonies and could not have just flown in. "Many times, static aircraft are used for the ceremonies, as operational requirements dictate flight schedules and aircraft availability," said a Department of Defense spokesperson, Navy Cmdr. Amy Derrick-Frost. The Pentagon said its own words, used since 2006, had led to the ceremonies being "misinterpreted" as arrivals. "Based on how media announcements and ceremony remarks are currently written, it is understandable how these 'arrival' ceremonies might be misinterpreted, leading one to believe the ceremonies are 'dignified transfer ceremonies,' which they are not." She said the Pentagon is reviewing its procedures and is committed to conducting all recovery operations honorably. NBC asked about another discrepancy: Current and former JPAC employees said that the emcee often announces that the remains were from specific countries where JPAC staff had not recently recovered remains. The Pentagon statement said that the correct country is always announced, but that it may have been a few months since the remains were recovered. And occasionally, it said, there has been no JPAC mission to a country, but the remains have been turned over by those countries and are still deserving of a "symbolic tribute." Other veterans, a former POW's wife, even the bagpiper at the ceremonies — all told NBC they had assumed the arrival ceremony meant that soldiers' remains were actually arriving. They said they found the ceremony to be moving. "It was a very humbling experience for me," said bagpiper Alan Miyamura. "The thing that I remember most vividly is the silence. ... It meant respect and a feeling that these soldiers are welcomed home." The ceremony "makes me very proud that our country does such a thing," said Carole Hickerson, whose first husband was a POW in the Vietnam War. She helped design the black POW/MIA flag. "You don't know how important a funeral is until you don't have one." After NBC News requested permission to attend an arrival ceremony in July, JPAC canceled the ceremony. It hasn't held any ceremonies since April, scheduling and canceling them repeatedly. The Pentagon spokesperson said the commander of JPAC, Army Maj. Gen. Kelly K. McKeague, authorized in April the renaming of the ceremonies "to more accurately reflect the purpose of these events." However, public affairs staff at JPAC, which organized the events, continued to call them "arrival ceremonies" on into the summer, and until Wednesday they were still identified that way on the agency's website. (That page of the JPAC website was renamed to "honors ceremonies" on Wednesday.) The Pentagon would not answer when asked when Gen. McKeague and other military officers became aware that the public was being misled. NBC asked on Oct. 3 to interview Gen. McKeague as well as the scientific director and head of the laboratory, Dr. Thomas Holland, and Johnie Webb, who directs the ceremonies as deputy to the commander for external relations and legislative affairs. McKeague and Webb did not respond to an email from NBC. Holland replied briefly, saying, "I hope you get permission" for the interview. "I have no control over ceremonies." Several investigations of JPAC are under way, in Congress and inside the Pentagon. An internal report called the agency "acutely dysfunctional," and a Government Accountability Office report said the effort to identify missing and unknown service men and women has been undermined by squabbling between agencies. Photographs were taken before and after at an arrival ceremony in April 2012 by Rick Stone, a former police chief who was the deputy chief in JPAC's World War II investigations branch. (Photographs are allowed on the base, according to the JPAC public affairs office, in any area where there is no sign specifically forbidding them.) When remains are brought back by JPAC staff, Stone said, they arrive from the airport in a plastic box in an employee's private vehicle, with no ceremony. On Aug. 1, NBC reported that Stone's requests to disinter bodies of war dead for identification had been denied even when he had been able to narrow the possible identities to only a few, or even just one, possible match among the MIAs. Stone said he supports the honorable mission of JPAC, but began to see the "arrival ceremonies" as symbolic of the way JPAC focused on public relations while it keeps information from the families of missing warriors. "It's an open fraud inside JPAC," he said of the arrival ceremonies. "But it's more than just the arrival ceremony. The fraud is really their inability to bring closure to more families. Our noble mission is to go find some of these kids, and this thing is so fouled up we don't even recognize the mission." YOU CAN HELP: Do you have documents or information about the Pentagon's effort to identify MIAs? Send to bill.dedman@nbcuni.com.